Kathy’s favorite cake of the month! This cake has our hand made pearls and Kathy’s brush embroidery! Kathy and Company catered for the first time at Huguenot Mill Loft June 12, 2010. Carrie Bunnell chose a four tiered cake with Almond, Strawberry, Marble, and wedding white. The bride surprised the groom, Ryan Tiller, with a milk fountain and chocolate chip cookies for his groom’s cake! Almond Chicken Salad inside croissants! Strawberry tree with fruit and vegetable display beside Hot Spinach Artichoke Dip! Downtown Greer welcomed the wedding of familes Akers and Fowler. The bride and groom danced in the rain and partied at the Davenport. Guest were served a lovely buffet and a modern sleek cake topped with personal topper. The cake flavors were Raspberry Fudge, Almond, Strawberry and Chocolate with Raspberry. Kathy and Company announces our newest flavor White Chocolate Cake with White Chocolate Raspberry filling. seemed to be the key word to describe our wedding cakes for Saturday, April 17. We started at the Cliffs of Glassy with the Sagedy/Kallman wedding cake featuring Kathy’s life size sugar roses and leaves in pale pink with guava highlights. The Henson/Schmidt wedding cake at the Poinsett Club featured a mixture of sugar flowers including our green hydrangeas. The Defantes/Brookey reception at the Commerce Club featured beautiful hand-painted sugar cattleya orchids. Check out our other cakes that were delivered to Twigs Tiempietto and Mary’s Cottage on our facebook www.facebook.com/kathyandcompany. Saturday, April 10th was an exciting weekend at Kathy and Company. 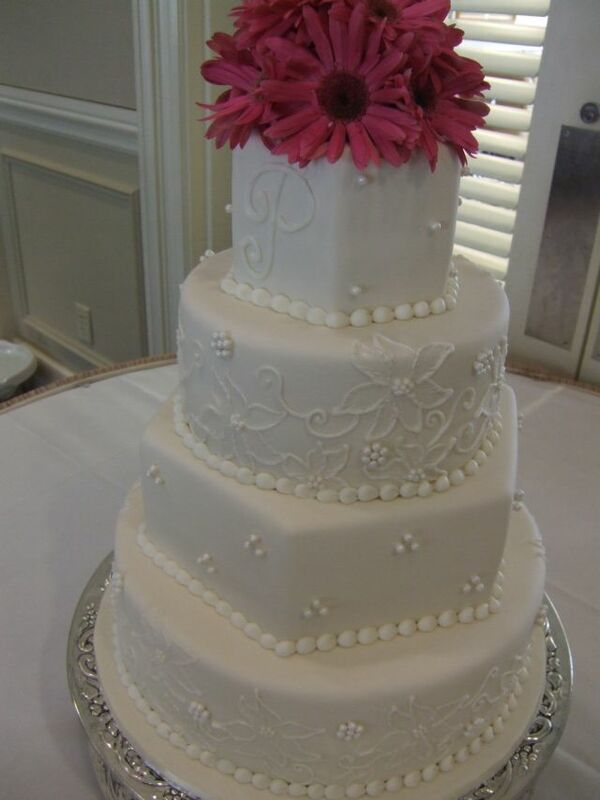 Julie delivered cakes to Woodburn Plantation and Westin Poinsett while Kathy headed to Atlanta to deliver Cristina Buffone’s wedding and groom’s cake. Cristina’s cake was a brush embroidery design to match her wedding dress on dark kahlua fondant which actually looked like a milk chocolate fondant. 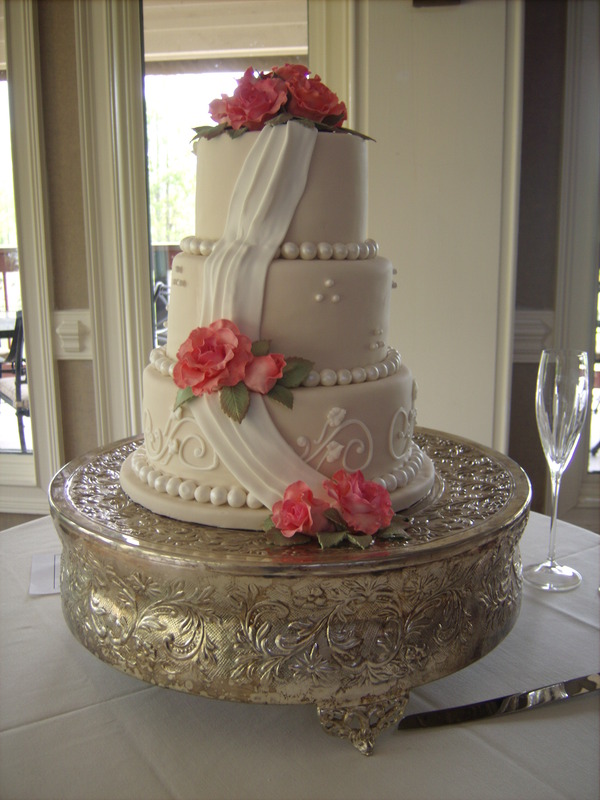 The cake was topped with Kathy’s life-size gumpaste roses in pink. Jaclyn Showalter, Catering Director for the Grand Hyatt, relayed their head executive chef’s comments about my wedding cake to me which made my day, week, month etc! He told Jaclyn that my cake was perfect. She asked him exactly what he meant because she has never heard him say that about a cake. He said the fondant is smooth with no bubbles or indentions and the brush embroidery is done freehanded rather than being marked with a pattern and piped over. He commented that it probably took me between 8 and 10 hours to pipe the 5 tier cake (and he is exactly right, I spent 8 1/2 hours just on the design). And, he said the gumpaste roses are phenomenal! (Thank you Diana Tornow, fellow SC ICES member, for hints on making perfect gumpaste roses.) Even though I could see my flaws, the chef’s comments certainly made the entire trip to Atlanta worthwhile for me. And, thanks Domenick Buffone for the room with the wonderful 19th floor view of Buckhead. (Domenick, Cristina’s dad is the manager of the Greenville Hyatt.) Check out our pictures.